The vehicle used sensors and laser navigation to autonomously guide itself toward the outpost. During the mission’s post-launch press briefing on April 2, Jessica Jensen, the director of Dragon mission management at SpaceX, told SpaceFlight Insider that the spacecraft performs hundreds to thousands of thruster firings of its Draco engines during its two-day journey to the ISS. Although she said the majority of those are for attitude adjustment and pointing, a few major burns were used to push the spacecraft from its initial insertion orbit to the orbit of the orbiting laboratory. Once the capsule was within about 33 feet (10 meters) of the Earth-facing side of the Destiny laboratory module, Kanai used Canadarm2 to grab the grapple fixture on Dragons Guidance, Navigation and Control bay door. 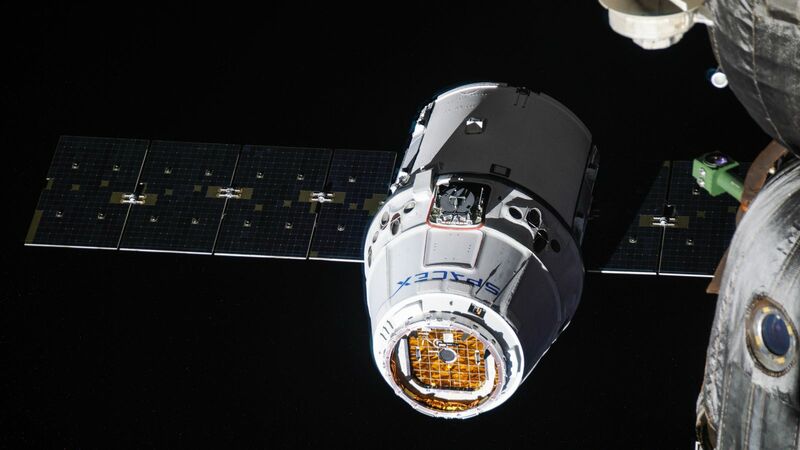 The CRS-14 Dragon was then maneuvered over the course of two hours to just below the Earth-facing port of the Harmony module, located on the the forward end of the space station. The official time of the bolting of the spacecraft and station together was 9 a.m. EDT (13:00 GMT). Dragon launched atop a Falcon 9 rocket at 4:30 p.m. EDT (20:30 GMT) April 2, 2018. It carries 5,836 pounds (2,647 kilograms) of food, experiments and hardware, which includes several items in the spacecraft’s unpressurized trunk such as the Atmosphere-Space Interaction Monitor (ASIM) and the Materials ISS Experiment Flight Facility (MISSE-FF). The pressure vessel for this spacecraft was the same one used during the CRS-8 mission in April 2016. Notably, that mission brought the Bigelow Aerospace Activity Module (BEAM) to the ISS where it still resides today. Over the course of a one-month stay at the ISS, the capsule will be unloaded. Then the craft will be reloaded with unneeded equipment (including Robonaut2, which is returning to Earth for repairs), completed experiments, and trash for return to Earth. After it is unberthed on May 2, 2018, it will autonomously move away from the space station and then, several hours later, use its Draco thrusters to perform a 10-minute de-orbit burn. It will splash down in the Pacific Ocean west of the coast of Baja California.